For many people, grammar is boring. 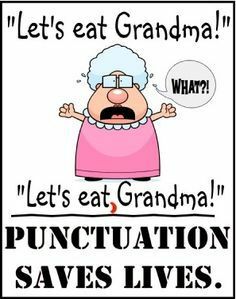 Commas are used in many situations, however, perhaps famously for pauses. Yet this is a myth! And incorrect! Commas are in fact incredibly versatile and used in many situations, including marking non-restrictive clauses, separating clauses in a sentence, separating introductory words and additional information, separating items in lists, separating coordinate adjectives, introducing quotes, introductory words and phrases, parenthetical clauses, and for separating information at the end of a sentence. This is an optional comma before the word ‘and’ at the end of a list. Straightforward lists don’t require them, although sometimes they can help the reader and break the list up. 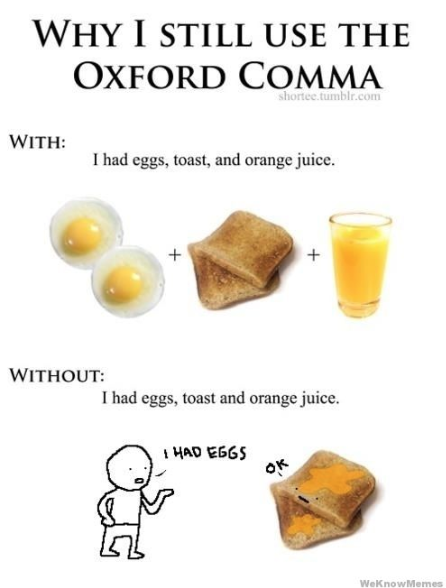 However, there a few occasions where the Oxford comma is needed…. And thus, the importance of the comma! I’m a big fan of commas – not a sentence you hear often. Use them liberally in my writing. 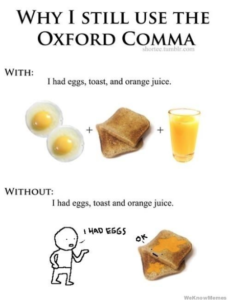 Have to admit that Oxford Comma info was new to me.